In order to make agricultural production become more convenient, also meet the requirement of the modern intelligent agriculture to make control equipment integrated and miniaturization, the paper designed a wireless sensor middleware based on STM32. This wireless gateway receives control command from the control software of agricultural IOT application which installed in the tablet computer through the WiFi/USART module, after the data processing and protocol conversion, then send the control signal to the wireless sensor network through the USART port. 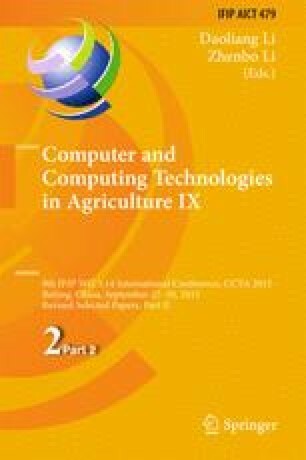 At the same time, if a particular model of agricultural sensor changes state, it also can timely feedback to the tablet computer to display through the gateway. This plan solved the problem of real-time monitoring of agricultural information and realized remote control. The experimental results show that, the wireless sensor middleware has the characteristics of light and handy, high control precision, data large quantity and high speed. It’s very appropriate for intelligent agricultural system application. Funds for this research was provided by the National Science and Technology Support Program (2014BAD08B05-02), Shandong Academy of Agricultural Sciences (SAAS) Youth Scientific Research Funds Project (2015YQN58), Independent Innovation Projects of Shandong Province (2014ZZCX07104).